Colonial Heights City Hall is located at 201 James Avenue, Colonial Heights, VA 23834; phone: 804-520-9266. Photo: Oak Hill (Dunn's Hill), ca. 1810, 151 Carroll Avenue, Colonial Heights, VA. Listed on the National Register of Historic Places in 1974. 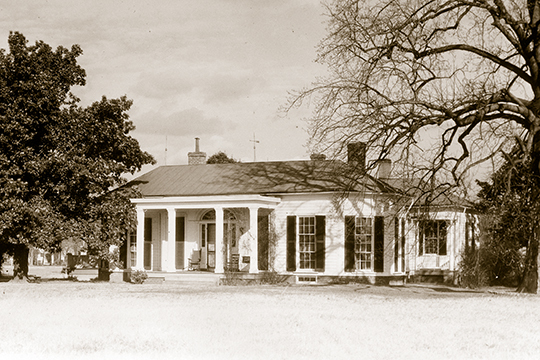 Photographed by unknown, n.d., Historic American Buildings Survey [HABS VA-125], memory.loc.gov, accessed February, 2014. When John Wood mapped Chesterfield County in 1820, the land area of present-day Colonial Heights, between Swift Creek and the Appomattox River, was criss-crossed with a network of roads. A grid of blocks and streets marked the village of Pocahontas (laid out in 1752) shown on the east side of the bridge to Petersburg. At the bridge, Conduit Road (then Conjuror's Neck Road) and the Boulevard (then the "Turnpike Road" between Manchester and Petersburg) converged. Several plantations occupied the expansive "heights" overlooking Petersburg and the Appomattox River. From Conjurer's Neck, extending south and east along the Appomattox River were plantations associated with Kennon (Brick) House, Roslyn, Violet Bank, Oak Hill, Mount Pleasant, and Ellerslie. Development on the north bank of the Appomattox River was dwarfed by the growth of Petersburg. Civil War-era maps showed that while the north bank was served by several roads and the Richmond & Petersburg Railroad, Petersburg was connected to four major railroad lines, numerous roads, and a canal. In 1888, when LaPrade published a Map of Chesterfield County, what would become Colonial Heights encompassed several "shops" and numerous plantations. LaPrade depicted Violet Bank (for which an adjacent neighborhood was named), Oak Hill, Lynch, Wakefield, Brown, Andrews, Whitehead, Hankins and a couple dozen other unnamed farms. The birth of the American suburb was influenced by the "White City," a showcase designed by Frederick Law Olmstead for the World's Fair Columbian Exposition of 1893. The emphasis on the classical orders of architecture, orderly planning, and cleanliness appealed to the expanding and increasingly prosperous American middle class. By the late-nineteenth century, American cities were considered overcrowded, dirty, and noisy. In response to a nationwide desire to live in a clean, healthy environment, families looked to outlying "green" areas that were increasingly accessible through improvements in transportation. Early twentieth-century suburbs were platted, subdivided and built according to a plan and laid out in accordance with specific design principles. The new, emerging model for residential neighborhoods offered efficient, comfortable houses constructed in then-fashionable architectural styles. A map of Colonial Heights, compiled in 1924 from early-twentieth-century "plats of record," showed that the present-day City of Colonial Heights was almost wholly composed of contiguous, named suburbs: Colonial Heights (1910); Colonial Heights Extended (1912); Chesterfield Heights (1916); Chesterfield Highlands (1916); Riverside Park (1916/1920); Riverview (1923); Chesterfield Place; Oak Hill Place; and City View Place. Chesterfield Highlands stands out as the largest and one of the earliest of the designed suburbs situated near the center of Colonial Heights. Nancy W. Kraus, First & Main, LLC, Chesterfield Highlands Historic District, Colonial Heights City, Virginia, nomination document, 2012, National Park Service, National Register of Historic Places, Washington, D.C.